I’ve had a week, and it’s only Wednesday night. Yesterday I spent the day at our Children’s Hospital for Liam’s annual pin cushion and cardio fun house and today is the day that my father died – sixteen years ago. It’s ironic that my father never met Liam because I think he would have been intrigued by his heart. My dad was a mechanic, a truck driver, a welder, a jack of all trades. He could fix engines, carburetors, ignitions, steering columns, build stairs, lay tile, install anything . . . he was mechanically inclined. My dad fixing something with the omnipresent Leather-man (I will always own one). I remember as a little girl and voracious reader, thumbing through my dad’s Popular Mec hanics book series looking for science experiments to do for the annual science fair. I saw engines and circuits, and I was bored. My dad always helped me with my science project – we once magnetized a screw driver with a battery, did something once with rust. He helped me assemble and then I wrote the report. While I often disassembled things (radios, clocks, watches, calculators, etc. ), I never really bothered to figure out how they worked. I just wanted to look at the mess of parts. I stared at the chaos of metal and wire like they were strokes in an abstract painting. I didn’t get how it worked, but I could appreciate the different colors of wire, the keen knots holding them to tiny bolts, the art of the machine even as the function of it eluded me. My dad was the grand marshal of his private parade of used cars that came and went in front of our home as he took apart broken machines and made them run again, a habit that may or may not be profitable depending on the broken parts, their cost and availability. My only role in this process was to hold a quivering flashlight under the body of a car or into the cave that held the engine and all its friends. Given that I couldn’t tell right from left until high school, my “assistance” didn’t often go well. In my life I’ve broken vacuum cleaners, washing machines, driers, hair driers, curling irons, and both of my feet in the simple act of climbing stairs. Whatever mechanical grace my father possessed (and my mother still possesses with a sewing machine) skipped me entirely. 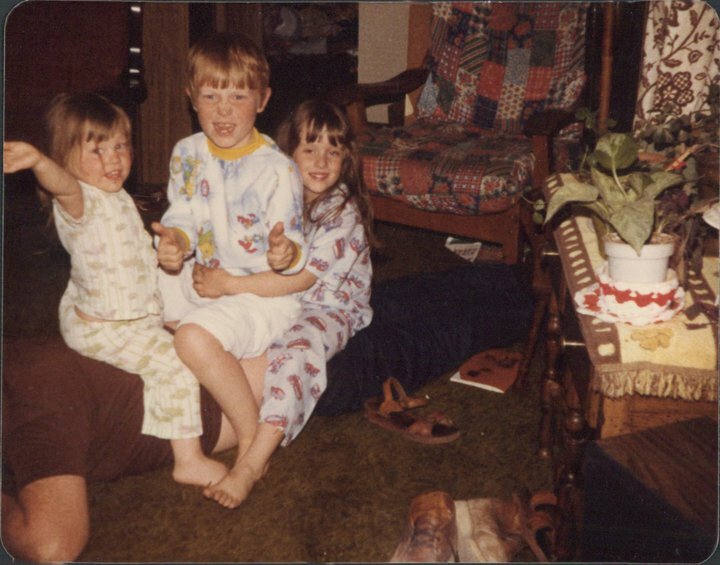 Me, my brother and our middle younger sister sitting on our dad – his idea of back massage. I was always the odd duck with my nose buried in books, refusing to go outside, learn how to ride a bike, and taking five extra years to learn how to drive. My brain was a speeding machine moving so fast no one could see, so I was entirely misunderstood. I was a clumsy, lonely child, but my dad saw potential. He saw promise and he made predictions for my life with my strange sponge-like brain. My dad saw the value in my internal mechanics, even if no one understood a child in the 1970s who today would be diagnosed with sensory integration issues. While the rest of my family teased me about not having any friends and being antisocial, my dad told me I’d be a success one day. He was the first person to invest in my future, not in money but in faith. I don’t particularly like machines, though through my work as a science writer I do understand them. Then, I gave birth to a child who is in so many ways cruel ways like a machine – the little tin man born with a heart that did not work properly and the courage of a mighty Lion. I believe my dad would find the mechanics of his third grandson intriguing. I think he would probably be the one person on my side of the family who could really understand the complexity of my son’s anatomy and how I ride out Liam’s life waiting for the next correction just as my father rode out an assortment of cars he knew to be imperfect. At one point in my childhood, we had this cream-colored Volvo station wagon my dad got at a police auction. The day would come, after the fifth or so alternator, that he would give up on this tank of a car, but in the summer of 1987 we still held out hope for the Volvo. That summer I was thirteen, and we were en route from Colorado to my grandparent’s house in South Dakota. The Volvo broke down halfway there, and my dad knew why without getting out of the car or opening the hood. The breakdown was caused by a worn and now broken fan belt that he knew before the trip began was at risk. Dad had a spare in the back of the station wagon, beneath the duffel bags and fourth child who couldn’t fit in the backseat – probably my brother on that trip. So that night in Wyoming, we waited on the side of the highway as the sun set, waiting for the earth and the engine to cool down enough for Dad to get the belt back in place. He’d even brought water to pour over the engine to cool it down, but an engine gets rather hot after 180 miles. My brother probably held the flash light because he always had a steady hand. In the dark, the belt was on and we headed North, over the prairie to Grandmother’s house we went. Later the same year I clipped a Sunday comic of Fox Trot where all three kids were sitting on the roof of an oddly familiar station wagon, singing the chorus of Simon & Garfunkel’s “Homeward Bound,” in the bubble caption while their father grumbled under the hood of the car. My father didn’t find it particularly funny, but I held on to that clipping for many years. Being stuck on the side of the road wasn’t that big of a deal, and while I always wondered why he didn’t change the belt before it broke, I thought my father the wiser for having it in the car and prepared if the engine didn’t make it all the way to Rapid City. Irony of ironies, Liam’s heart seems like that Volvo. We aren’t moving ahead with the pacemaker until the last shreds of health are stripped from his heart’s ability to keep rhythm. We watch his expanding liver protrude and stall at four centimeters bigger than it should be. We monitor his leaking aortic valve, his regurgitating mitral valve – his only two heart valves. We celebrate his lung pressures which magically normalized, and we grumble that his oxygen saturation seem permanently low. Liam receives a mechanical evaluation on his system, and we know. . . we know that the mileage of these original and spare parts is unknown. So I try to prepare. I send Liam to a therapist to talk about his anxiety, what it’s like to be a little boy who is also living the life of a machine in need of fixing, in danger of breaking down. I try to prepare by working so hard with the research fundraising, trying to get money for the parts that haven’t been invented yet that my child may need in thirty years or twenty, or ten or two years. I’m finding the best clinic in the world to watch him more closely. I’m always trying to understand the mechanics of his heart because I love my boy so much. My dad’s been gone sixteen years today, but he left me his appreciation of mechanics, even if I don’t possess his gift for it. I was bemused by his tinkering and amazed by his ability. I miss that about him, not just because it was extremely helpful, but because it was unique. My dad could fix anything, but no one can fully fix my child. I also think, more than anyone else, my dad would have understood what it’s like just waiting for something to break. The difference is he would have known how to fix the cars and engines of his expertise. No one can fix a half heart for good, so I’m just waiting to see what breaks and how long we can keep driving on these wheels. If you’d asked the doctors in Denver in 2005, when they did triple medical reviews on Liam and weren’t sure he’d ever be able to handle the Fontan that he would look as good as he does today, they wouldn’t have believed it. Our doctor remembered them all talking about how Liam wasn’t ready for the Fontan and it was too dangerous to proceed when he was two because of his lung pressures before the Glenn revision. The simple truth is, given the parts they started with, even with the best surgical mechanics, Liam should never have done as well as he’s done. He’s a miracle, and I like to think that maybe, my dad with all his mechanical wizardry is Liam’s guardian angel, and has hovered over him in those operating rooms all those many times, working his magic by inspiring the men who’ve saved my son so many times over. It gives me some small comfort that if we run out of the right parts at the right time, Liam will have someone I trust waiting for him and with him while they wait together for Jim and me. Of course, I don’t like thinking about that, but days like today and weeks like this bring those thoughts to the front of mind, don’t they? Christopher Hitchens, who died of the same disease as my father, would have poo-pood my little coping cup of comfort, but I believe life is magical and irony and coincidence can be serendipitous. I believe that nothing happens by chance but by design – I believe in the mechanics of the universe. I firmly believe in my blessings not my baggage, because seeing the whole of my sometimes hard life as a blessing gives me the strength to bear it. I am humbled that I have so many blessings to bear. Tricuspid atresia – a missing valve that led to Liam’s right side of his heart never forming. He has nine other heart defects, all but two of them fatal in infancy and the last two are fatal if left untreated. Liam’s many defects made him an unlikely success, but here we are, almost ten years later. Oh Amanda… I really cried my eyes out reading this post. Once I reached the part where you mention your dad being in the operating room with Liam I lost it. I feel exactly the same way you do. There’s something, someone watching out for Natalie. I always felt that it was my dad. 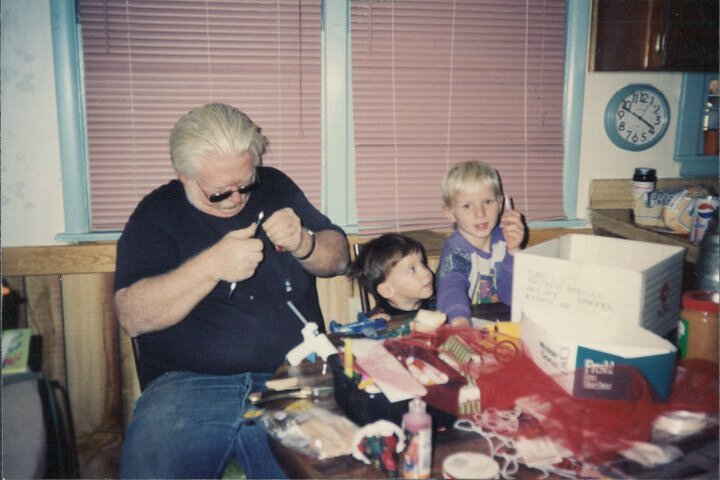 My dad was a tinkerer, too. Always tinkering with electronics, bikes, and anything else complicated and small enough to fit into his small Portland apartment. Even growing up he would take apart VCRs, TVs, and radios for fun. I always thought that some of the pieces looked like candy or pills. lol I am so so much in awe of you. This post was exactly what I needed to read and you are so incredible for sharing this. As always, your writing is amazing. My dad never met Natalie either.. I forgot to mention that.